Cyprus is an island of varied character, combining a magical blend of romance, history and relaxation with cosmopolitan cities and a modern infrastructure. The crystal clear waters of the Mediterranean, the sunny beaches and the unspoilt coastline, contrasted by the wooded mountain range, Cyprus has something for everyone! The enchanting island of Cyprus enjoys the essential ingredients of a holiday destination. But 8,000 years of turbulent history ensure that there is much more to the third largest island in the Mediterranean than just sun, sea and sand. The wild landscape of the Akamas peninsula in the west has remained largely unspoiled. To the north, Polis offers candlelit tavernas and presents an image of modest prosperity. Head west from Polis to the so-called Baths of Aphrodite, where it is said that the goddess fell in love with Akamas. Further south, the Paphos region is full of scenic beauty. From the pine forest clad slopes of the Troodos mountains, down to the rocky coastline, and crystal clear water. Taste wonderful fish in the harbour area of Kato (Lower) Paphos. Saturday is market day in the upper part of the city. The enviable year round climate produces a very rich variety of fruit and vegetables. The wide selection of local wines offer reasonable value, and the local brandy is also very good. Above all, try a (fish) meze - literally, an extract of the Cypriot cuisine. This is the best way to discover the traditional Cypriot dishes. Due to the mild and healty climate, Cyprus is not only the perfect holiday site but also an ideal place to live. 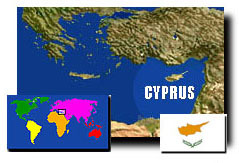 As mentioned above, Cyprus is the third largest island in the Mediterranean. It is situated at the north-eastern of the east Mediterranean. The Greek mainland is about 800km to the west and the nearest Greek islands is Rodes and Garpathos 380km to the west. For people who own a house in Cyprus and want to promote it through this site, please click on Promote property.